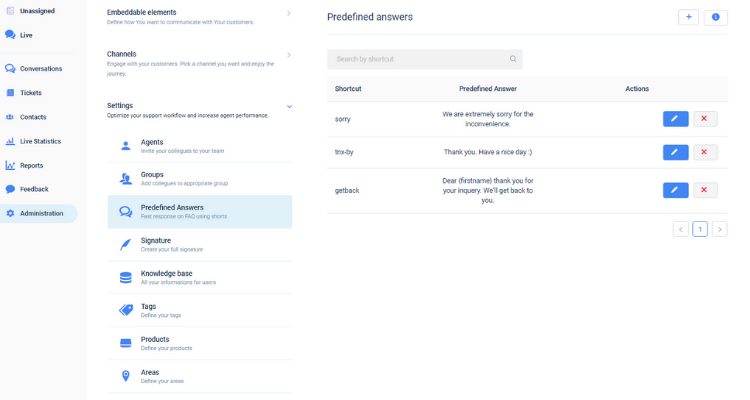 Predefined answers allows you fast response to customers on frequently asked questions. A visitor may come to the website and ask where he can find his Billing data, for example, which may be a popular question. So, rather than representatives typing out their answer over and over, create your own predefined answer. In order to add new Predefined answer press on ‘+’ icon in the upper right corner. 2. Predefined answer – answer that will show to a customer, full-text message of shortcut define in the previous step. After defining those two things click on Save to create your new predefined answer. You can always edit(clicking on blue pen icon next to the shortcut) or delete(clicking on the red trash can icon next to the edit button) all the predefined answers at your disposal.